Zoë is a professional teacher whose enthusiasm for singing is infectious, she has been singing in choirs since the age of 9 and made the televised final of ‘Sing out 2000’ as part of UWE’s chamber choir. She joined Stroud Choral Society in 2006 and has been a very active choir member, soloist and committee member ever since. 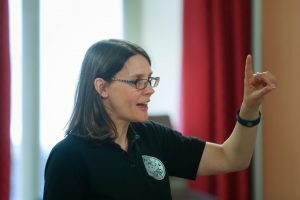 She took the role of The Minpins Musical Director when they formed in 2015 and has enjoyed the challenge of establishing and shaping the choir to the high standard it is today. From September 2017 she has also taken on the running of the new Stroud Choral Youth Choir. Zoë also runs the Nailsworth Primary School Choir and has recently been employed as a vocal coach for Gloucestershire Music, running a new adult choir and two children’s choirs at the Five Valleys Music Centre.